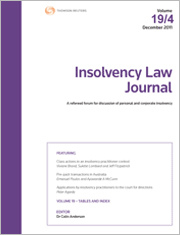 The Insolvency Law Journal (ISSN: 1039-3293) covers the whole area of insolvency practice in Australia including bankruptcy, company liquidation and receivership and voluntary administration. It examines both the practical and theoretical issues of this growing area of law and looks at topical issues in the corporate world. In-depth articles and brief notes discuss important topics of interest and current developments and trends in insolvency legislation. Prominent insolvency practitioners and leading academics from around the world contribute to each issue. The Recent Developments section examines relevant cases, changes to legislation, discussion around reform papers as well as book reviews. The journal is headed by General Editors, Professor Rosalind Mason and Dr David Morrison. Professor Mason is a member of the Commercial and Property Law Research Centre, QUT Faculty of Law. As a scholar, Rosalind has specialised primarily in cross-border insolvency law and also written on personal insolvency law. She was an invited member of the Insolvency Law Advisory Group to Treasury examining domestic adoption of the UNCITRAL Model Law on Cross-border Insolvency in 2006 as well as an expert group established by Australian Treasury and the New Zealand Department of Economic Development to work on enhancements to trans-Tasman cross-border insolvency arrangements in 2010. More recently, she led a QUT research project on the ALI-III Transnational Insolvency: Global Principles for Cooperation in International Insolvency Cases for the Australian Academy of Law. Rosalind is a co-Chair of the Expert Advisory Group on WGV Insolvency to the UNCITRAL National Coordinating Committee of Australia. In 2015 Rosalind was appointed as the Chair of the Academics’ Group of INSOL International. Dr Morrison is an interdisciplinary researcher whose interests lie at the intersection of taxation law, corporate and insolvency law, bankruptcy, finance law and financial literacy as those interests apply to finance, the economy, social and policy framework and climate change. Associate Professor Morrison researches around law and finance especially as it applies to literacy and support for generational change. The recipient of three ARC research grants and a UQ Vice-Chancellors Research Excellence award, Associate Professor Morrison has held over 20 research grants and has published extensively including papers, conferences and as co-author of Voluntary Administration Thomson service. Associate Professor Morrison holds the degrees of BCom, LLB, MFM, LLM, GCEd and PhD (Qld), he holds the professional qualifications of Barrister-at-law, Chartered Accountant (CA), Fellow of the Financial Services Institute of Australia (FFin), and is a Chartered Tax Advisor of The Taxation Institute (CTA). The consolidated table of authors and articles for this Journal is available here.